I first recall hearing the term explained by my eighth grade U.S. History teacher when discussing the lead-up to the industrial revolution which made America the world’s preeminent economy in the 19th century – the opening act of a success story that continues to this day. The concept as she explained it was simple: it’s a tax added to goods foreign countries export to this country, which in effect makes them more expensive. As a result, American-made products (which aren’t subject to the tax) appear less or equally costly, allowing them to compete with other nations. Needless to say my teacher didn’t mention American consumers essentially pay the tax on the foreign products if they still choose to purchase them…but facts are facts. In the earliest days tariffs were passed to protect fledgling industries (such as textiles) that couldn’t hope to rival established foreign manufacturing giants like Great Britain. The agrarian nature of the former colonies-turned-states meant the U.S. could still rely on exporting its wealth of raw materials to resource-starved countries but if folks wanted a finished product, they might not be able to get it from homegrown producers. Eventually high tariffs helped the industrialized northern half of the U.S. grow into a manufacturing power. The south was left behind – its export-dependent commodity-based economy suffered under the weight of reciprocal tariffs and its reliance on slave labor to maintain and harvest cotton and tobacco only made the problem worse. The conflict eventually led to the American Civil War. In other words, regional and philosophical disputes over tariffs aren’t new, so there’s little surprise they’re causing such a kerfuffle among the political and intellectual commentating class today. 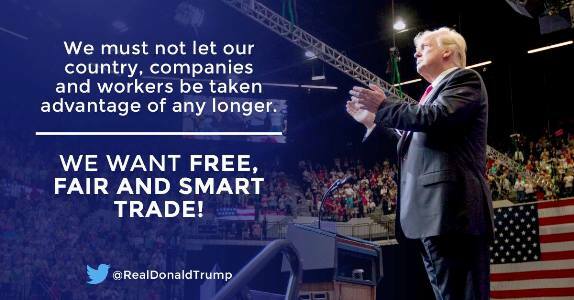 Fast forward to 2016 when then candidate Donald Trump based much of his “America First” campaign on the notion of protecting American industry against foreign competition that enjoys certain systemic advantages – government subsidies, tariffs of their own, cultural discrimination (to not buy American-made products) and what he deemed as one-sided unfair trade agreements. The message resonated with the “forgotten Americans” of the rust belt states who’ve watched in horror as their livelihoods left town and hope went along with them. Lost in last year’s fierce congressional battles over administration nominees, judicial appointments, tax reform and Obamacare repeal was the trade issue. If anything, Trump appeared to soften his stance on the subject and ceased threatening to ditch NAFTA or punish America’s trade competitors for their past protectionist sins. That is until recently. Kyle Feldscher of the Washington Examiner reported, “President Trump defended his tariffs on steel and aluminum Sunday night by arguing the decision would be the change needed to spark the domestic steel and aluminum industries. Feldscher subsequently presented statistics (from the Federal Reserve) showing both the domestic steel and aluminum industries are far from “dead” – in fact, they’re functioning at the same level (or even above) where they were decades ago. Once again Trump appears to be factually challenged but his underlying assertion is at least arguable: American industries need help and certain foreign countries have been taking advantage of open trade policies for years. Trump’s proposed tariffs include a 25-percent tax on steel imports and a 10 percent levy on aluminum imports, reported Feldscher. That’s a significant increase that, if actually put in place, would raise prices on these imports and theoretically make foreign products less competitive. Understandably, upon hearing the plan America’s trade competitors threatened to retaliate in kind. Critics argue tariffs mean everyone loses – governments included. Trump tweeted last week that “trade wars” are easy to win. In a media-televised meeting with industry heads everyone agreed higher tariffs were necessary to level the proverbial economic playing field. The CEOs and Trump nodded in unison that a non-shooting “war” was something America should feel good about declaring. Not everyone was wild about the idea, however. The Editors of the Washington Examiner wrote, “Economists disagree about almost everything, but they are unanimous that more commerce increases the wealth of any nation. This isn’t partisan. On the benefits of trade, there is no daylight between a staunch libertarian economist such as Milton Friedman and a Democratic partisan like Paul Krugman, nor anyone in between. All good points. But it shouldn’t be forgotten how Trump touched a nerve with people who see the issue his way. Granted there seem to be a preponderance of free trade believers in conservative circles but protectionists such as Pat Buchanan have insisted for years that excessive American governmental interference restrained American industries to the point where they couldn’t compete with foreign companies exploiting labor that costs pennies on the dollar. It doesn’t take a genius to figure out a Volkswagen made in Mexico with $1000 worth of labor will end up less expensive in American markets than one costing $3000 to build in the U.S.. There’s lots of blame to go around – American labor unions demanding higher wages and absurd benefits without corresponding increases in productivity; absurdly high corporate management salaries; automation; corporations more than happy to ship jobs overseas rather than paying Americans to do the work…the list goes on and on. Anyone who’s sought computer tech support over the phone knows you’re likely to be on the line with someone in India for a couple hours. Heck, a few years back I was almost on a first-name basis with half of New Delhi trying to get problems resolved; now I find it easier and faster to pay a little more and take my issues to the local computer repair shop. Call centers in developing countries are good business for local residents and tech companies but not necessarily for American jobs. It should also be noted many of those who adamantly oppose boosting tariffs are equally steadfast in favor of open borders-type immigration. The Silicon Valley tech giants condescendingly look down on Trump’s “America First” emphasis and call his stepped up immigration law enforcement proposals “racist” yet they have no problem denying American workers the first shot at jobs that are instead done cheaper by some schlepper in Malaysia. Still, there are lots of respectable people who hate the prospect of boosting tariff rates. Trusted conservative economists Larry Kudlow, Arthur Laffer and Stephen Moore wrote at The Hill, “Trump should also examine the historical record on tariffs, because they have almost never worked as intended and almost always deliver an unhappy ending. The Smoot Hawley tariff of 1929 signed into law by Herbert Hoover gave us the Great Depression and worsened it. Richard Nixon’s 10 percent import surcharge contributed to the stagflation of the 1970s. George W. Bush tried to save the steel industry by imposing tariffs on steel. If those tariffs worked, we wouldn't be having this discussion today. ‎We tried to save the color television industry with protectionist measures. Instead, they wiped out domestic production. In terms of guns and bombs, no. But if Canada’s own policies (does Canada subsidize industries?) are fostering an imbalance between the two countries, then yes. Kudlow, Laffer and Moore are economists who know curves, charts and graphs but even the shrewdest intellectuals can’t foresee the future. The past suggests our neighbors to the north will remain our greatest partners but there could be a time in the not so distant future where disagreements over various things could lead to non-shooting economic tensions. A less extreme example would be the United States’ relationship with China, a country that rivals our own in virtually every way -- except military spending. Take a stroll through Costco or Walmart and see how many of the products are made in China or other countries that aren’t exactly “friends” to America (even the Christmas nativity scenes were made there). Should the communist regime in Beijing suddenly decide to punish the United States for some perceived transgression all it would need to do is starve this country of certain vital imports. Say it couldn’t happen? Then not only can you not predict the future you lack understanding of human nature as well. There seems to be little doubt tariffs and trade wars usually bring about bad results for those waging them. But in demanding higher tariffs Trump the clever economic chess player may be thinking about negotiation positions several months or years down the road to pressure those “cheating” nations to reconsider their behavior and recognize there’s now an American president who’s serious about changing the international trade status quo. Foreign rivals must have realized Obama wouldn’t do it; certainly Hillary Clinton was of the same school. George W. Bush was the consummate establishment Republican who listened to the U.S. Chamber of Commerce first and the “deplorables” last. Is trying something new, as Trump suggested, really outside the realm of wisdom? Further, the American market is the number one selling opportunity for any manufacturer worldwide. There’s a ton of incentive to ignore the rules. Americans buy a lot of things from a lot of places. Focus on the ones that are the biggest scofflaws. Times are a-changing too. The future workforce will look different whether we like it or not. Bryan Dean Wright wrote at Fox News, “In late 2016 the Obama administration published an alarming study that showed upwards of 47 percent of American jobs might be eliminated due to the technological advances in robotics, automation and machine learning (RAML). The most vulnerable jobs included those filled by workers with lower pay, lower skills and less education. Naturally everyone supposes the “human” quality makes them personally irreplaceable. Think again – at least in terms of manufacturing. No matter what the naysayers claim the jury’s still out on the validity of trade protectionism. History seems to support many sides of the argument, but they can’t all be right. Perhaps President Trump is correct in saying it’s time for a change; either way it appears the swampy status quo is on its way out.